The spawn saturated plugs fit snugly into the drilled holes. Mushrooms blooming on a log gently decomposing in the woods. Just so we are all on the page, here is 3 minutes about mushrooms. I am not a mycologist, so this is neophyte’s attempt to explain an entire branch of terrestrial life. Fungi – mushrooms, yeast, and molds – are an entire taxonomic kingdom onto themselves (like animals, plants, amoebae, etc). Mushrooms that we see and eat are only the fruit of fungus. A fungus is a collection of weblike strands that thrive on the organic compounds in a decomposing wood, or pollutants like oil derivatives. (Last year there was a big outcry about Amazon fungi which thrive eating plastic bags in landfills.) 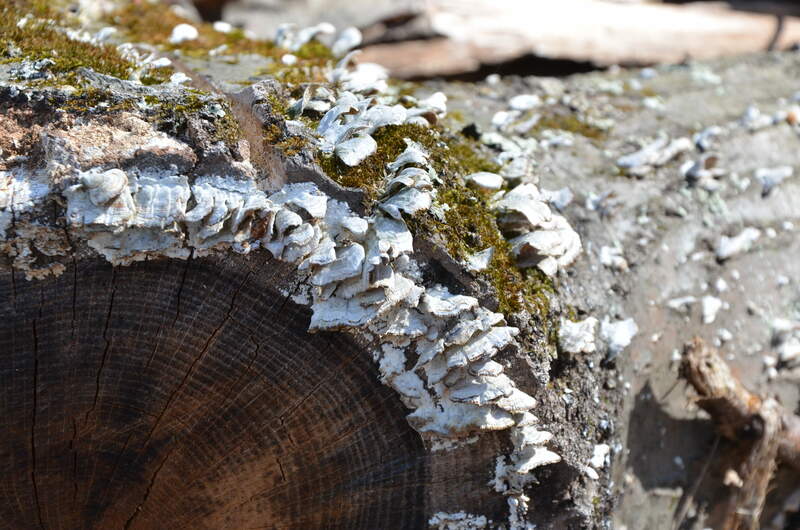 Wood that is left to decompose on the forest floor becomes colonized with many different species of fungi. 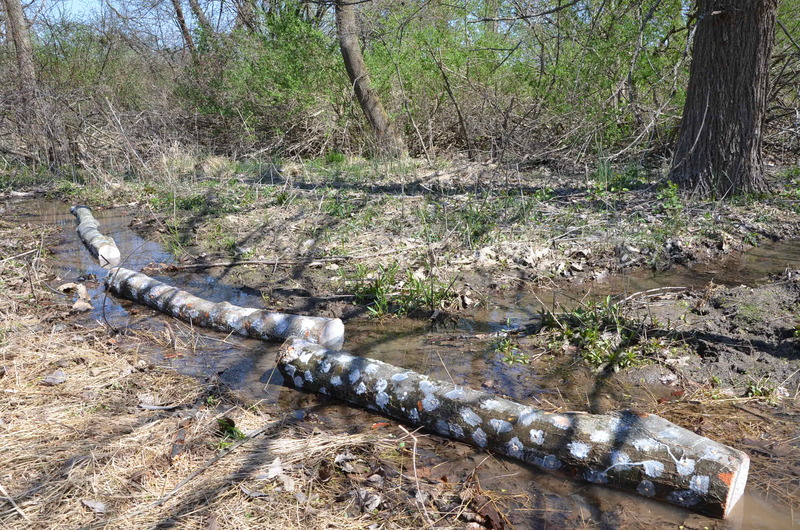 The fungal species that is able to outproduce and thereby dominate the other colonizers will be the one that eventually may fruit on that log. Fruiting happens when there is enough water in the soil (or log) to force the fruit to the surface. Here is a short snippet of a real mycologist, Nicholas P Money who wrote the book Mushroom, explaining how mushrooms reproduce once the fruit emerges (and he has a great accent). Here is what I learned from the process. 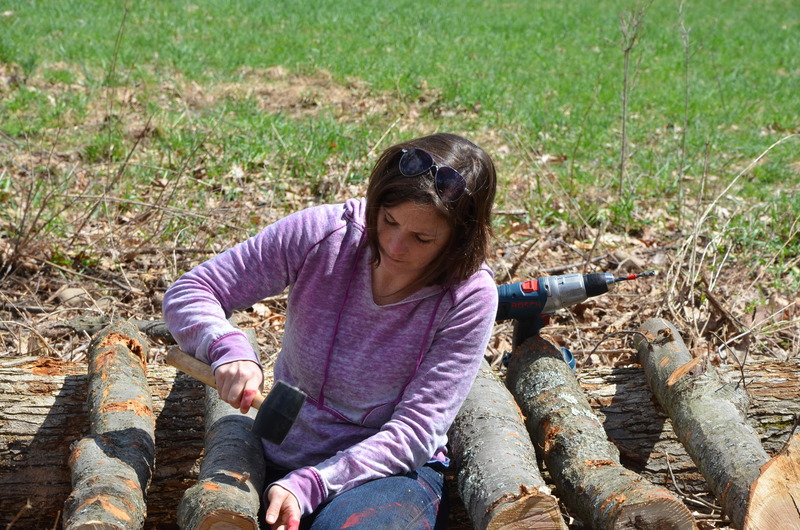 Make sure the logs are not more than four feet long – ours were five feet on the theory that we could bury them into the earth a foot (helping to keep them moist), but five feet logs are difficult to maneuver when your body is tired. Make sure you have either a drill that is attached to a plug, or many extra battery packs that you can recharge in the car while you drill – on average one battery pack would last us about one log (100-60 holes). If you want to go whole hog and paint wax on the holes make sure you have access to heat where the logs are – I ended up transporting the logs back and forth to our apartment. Our directions say we should make sure the logs are watered at least once a week or so, glad we have access to water! 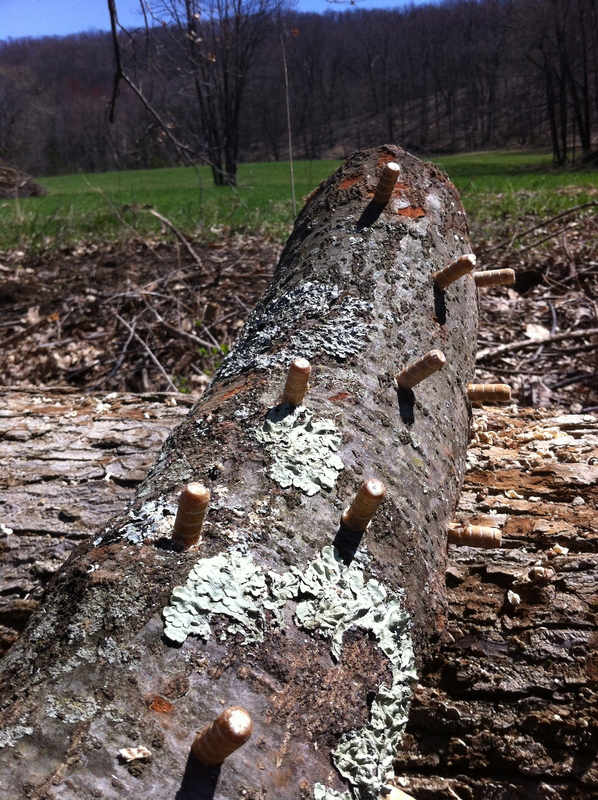 The weekend resulted in 4 fully inoculated logs. An entire veggie drawer in the fridge is full of plugs awaiting their logs. I am still committed to growing more mushrooms – however, pushing forward before we have power on the land (or at least not during the burn ban so I could melt the wax in a fire) throws up unwelcome hurdles. More mushrooms will wait until we have the infrastructure in place to make this easier. Cheers to more fungus amongus! This entry was posted in On the Farm and tagged Back to the Roots, Corinna Borden, Farm Beginnings, Inoculating Mushrooms, mushrooms, Real Time Farms. Bookmark the permalink.